Set in the legendary city of Ragusa (now Dubrovnik), Ragusa charges players with the task of building the city in the 15th century, constructing its great towers, boosting trade with the East, and finding their fortunes. Players build houses on the spaces between three hexes, gaining access to resources (on rural spaces) and actions (in the city), which means that a house effectively functions as a worker being placed, but triggering three spots at a time. Players use resources gained in the countryside to build buildings, trade, and craft valuable commodities — the value of which varies as ships come and go from the harbor. In the city, players gain access to actions, with each spot representing the three actions that surround it. This simple worker placement gives way to a deep engine-building mechanism as not only will building around production spaces utilize the houses you've already built in the countryside, but building near other player's houses will re-activate them, giving other players valuable opportunities outside of their turns. The game ends once players have placed all their houses. The player with the most points from all sources wins. 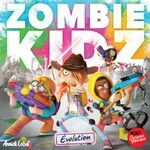 • In 2013, Canadian publisher Le Scorpion Masqué released Annick Lobet's Zombie Kidz, a co-operative game in which young players needed to lock up the cemetery or eliminate zombies to win. The young players are at school when zombies start to attack, infiltrating the entryways, then barring the way to classrooms. Players move through rooms and entryways to eliminate zombies and keep the zombie reserve full. If a zombie must enter the school but none are available, then the school has been overrun and the players lose. To win the game, players need to lock each of the four entryways as apparently the custodian has abandoned the post and given up the school for lost. As players get better, they can complete missions, track their development through a trophy-sticker system reminiscent of video games, and open envelopes that contain new material for the game, upping the challenge the face while also providing them new powers and new heroes as well. The game is played in a series of rounds. In each round, the players gamble to win a job, one player takes that job, then the other players play cards to stop them from finishing it. Along the way, they also try to bleed as much money from them as possible. After all, what are friends for? Jobs consist of a series of events, described on cards, which the player on the job must resolve with their ship, its contents, the cards in their hand, and whatever is in their stash. Along the way, all the players tell the tale of the adventure, describing how each card advances the scoundrel's story. Galactic Scoundrels is, more than anything, a storytelling game.